The chilly, cloudy day had me craving something warm and comforting for snack this afternoon. 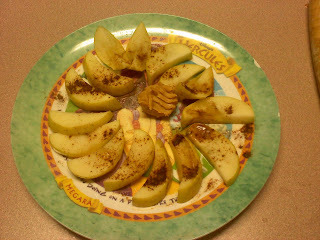 I sprinkled some cinnamon and splenda on a cut up golden delicious apple and microwaved the slices for 3 minutes. I put 1/2 tbsp of natural peanut butter in the middle. Along with this I had a nice big mug of Cinnamon Crumb Cake coffee!! Now my belly is full and warm!